#69. The main innovation brought by the following new multicrew procedure is the ability to define custom crew positions distributed among players. This will bring more tactical possibilities (e.g. getting a second crew only for permanent spotting at commander's post), compared to the current system which is definitely "rigid". #70. A n00b-friendly visual representation of the vehicle is used to make the learning curve less steep then it's currently the case. #71. Since members of a platoon are all waiting on the same screen when forming up, it would become pertinent to introduce a pop-up window that would notify when another member is inviting us to join his vehicle (first line of screens bellow), or asking permission to multicrew our currently reserved unit (second line of screens bellow). Once a platoon has deployed, or in mercenaries missions, it definitely becomes more difficult to efficiently exploit such a feature (people are already spawned while you're still creating a request), hence still requiring some communication efforts between players. #72. Though there is currently still a limitation of 2 players, it could later be extended to polycrew. #73. 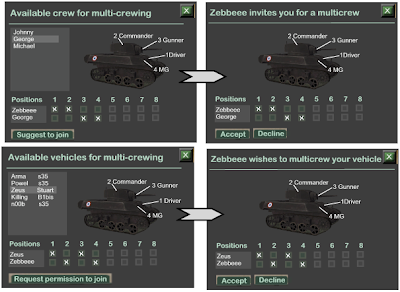 Joining a multicrewed vehicle cancels our current selection (origin and unit), and our settings are changed to the ones of the initial vehicle owner. #74. A ML could eventually require its members to polycrew vehicles in order to be approved in the platoon (leadership points could be earned when this happens). Congrats for the mulitcrew !